All transactions are safe and secure with a reliable history in online purchasing behind each of our associates. 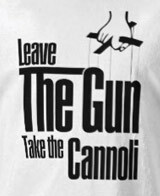 Buy the Leave the Gun Take the Cannoli t-shirt to own Godfather clothing and merchandise. This logo style black Godfather t-shirt features the famous quote that Clemenza says to Rocco after they kill Paulie, the driver of Don Vito Corleone (Marlon Brando). "Leave the gun, take the cannoli." This stylish The Godfather tee features text similar to that seen in the familiar Godfather logo for the Francis Ford Coppola film. This clothing item is a cool and unique way to show your respect for Il Padrino and the memorable mob movie. Wear it under a warm Godfather hoodie sweatshirt. In addition to the Leave the Gun Take the Cannoli tee above, browse the Godfather Clothing Gallery for more apparel like men's and women's clothes, kids shirts or hoodies.